I am looking at this stock BKCC and was shocked at one point at its price of only $0.97. Just within 1 hour of opening, BKCC traded between $0.97 and $9.5. How can this be so, particularly when it is actually quite liquid? The market cap is $6b. Not a penny stock prone to manipulation. Can someone explain? I am shell-shocked. Pursuant to Rule 11890(b) NASDAQ, on its own motion, in conjunction with BATS, and FINRA has determined to cancel all trades in security Blackrock Capital Investment. 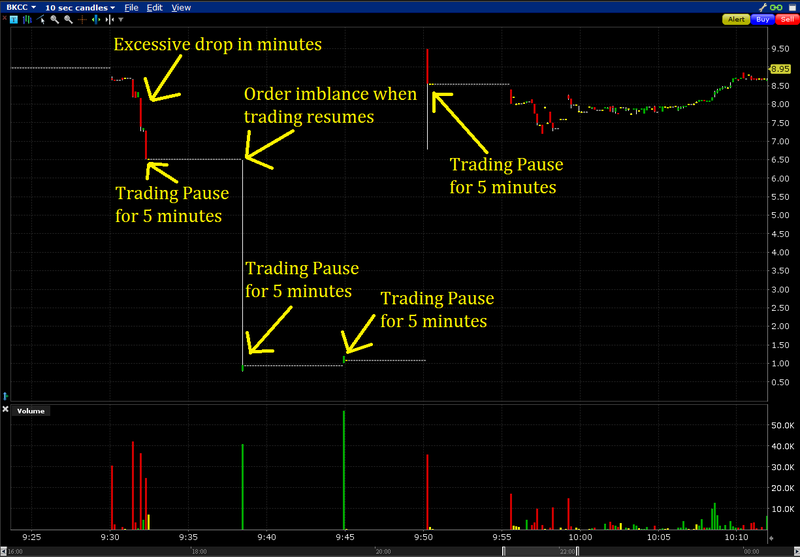 (Nasdaq: BKCC) at or below $5.86 that were executed in NASDAQ between 09:38:00 and 09:46:00 ET. This decision cannot be appealed. NASDAQ will be canceling trades on the participants behalf. A person on Reddit claimed that he was the buyer. He used Robinhood, a $0 commission broker and start-up. The canceled trades are reflected on CTA/UTP and the current charts will differ from the one posted below. It is an undesired effect of the 5-minute Trading Halt. It is not "within 1 hour of opening, BKCC traded between $0.97 and $9.5". Those trades only occurred for a few seconds on two occasions. One possible reason is that when the trading halt ended, there was a lot of Market Order to sell accumulated. Refer to the following chart, where each candle represents a 10 second period. As you can see, the low prices did not "sustain" for hours. As you know, the market is in turmoil today. At this moment, 11:45 am, the S&P is down 2.3%, 45 points. But, premarket, it was down 100 points. Now, premarket, I heard Jim Cramer say, "today is not the day to use market orders." Yes, on Mad Money, he seems a bit eccentric, but he does offer some wise advice at times. In my opinion, your stock had some people that did just that. A market order. And, regardless of the fundamentals of this company, buyers had no orders to buy. Except a couple wise guys (in both senses) that put in buys at crazy prices. And they filled. With an Apple, trading around $100, the book probably has millions of shares on order with a buy at $80 or higher. Just an example. I'd bet there were a number of stocks that had the profile of yours, i.e. a chart reflecting trades similar to a flash crash. There are some traders smiling ear to ear, and some crying in their beer. Not the answer you're looking for? Browse other questions tagged stocks trading stock-analysis volatility or ask your own question. If a stock is sold but the purchase was canceled by the exchange, will it be considered a short-sale? Why do more floating shares mean less volatility for the stock? Which is the most liquid market for trading? Why are there hidden bids and offers in the US stock market for the more illiquid stocks?